Ancient Stones - Lothian - 009 Stones, Kingside Hill, Cranshaws. Originally described as a stone circle early last century, this feature consists of seven earth fast boulders forming a circle about 3.20m in diameter. The stones vary is size with the largest measuring 0.70 x 0.60 x 0.60m. Four other earth fast boulders lie nearby and may have been part of this feature. 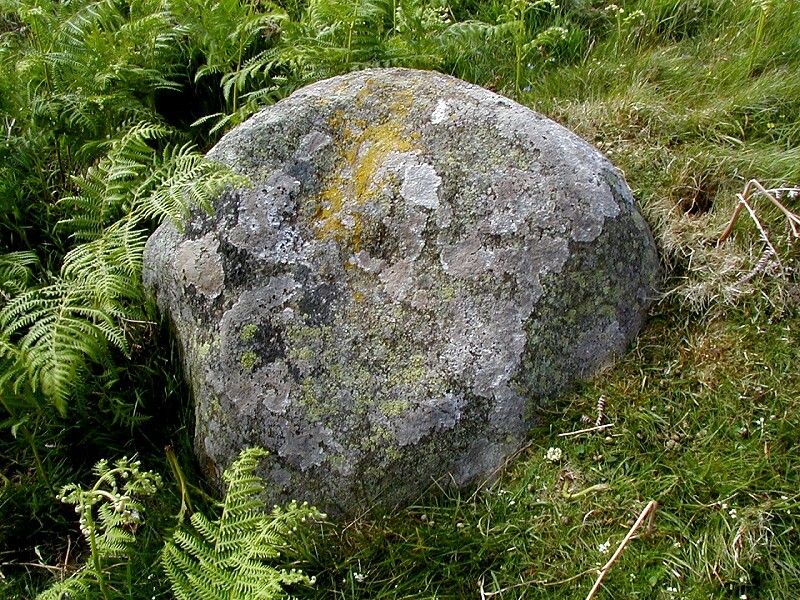 This setting of stones is most likely to be the remains of a cairn with the boulders forming the kerb. Taking the B6355 east from Gifford continue past the entrance to Mayshiel Farm. Go past the trees. The stones are about 10m from the road beyond the enclosed field, where open moorland begins. By road-side in field access drive. On my original visit to this location in June 2001 the exact location of this setting with unclear and I took a large pile of stones along the field boundary to be the stones indicated on the map. However, this later proved to be incorrect. Returning to the location again, this time armed with a print out for the entry in CANMORE and a GPS receiver, allowed me to go straight to the stones described here. They are easy to find when you know where to look and can just be seen from the roadside. Its a small but interesting group of stones. Worth a look if in the area.